Social media is sound bite media. We all know that. But people use those sound bites to promote their political and religious agendas. So that means the complex issues of the day need to be reduced to a poster with a one-line quote that can be shared on facebook. Ambiguities don’t fit there. Only dogmatic ascertains about how true your view is or how screwed up people must be if they disagree with you. So issues become one-dimensional. And so do people, for heroes and villains become part of this contest of bites. The one-line quote is often accompanied by the picture of a president or some other celebrity. The photo is flattering or disparaging depending on if you’re trying to deify or diss. Being a Christian, and having a great number of online friends who also bear that name, causes me to look at our heroes through that lens. And something rather fascinating has surfaced. American Christians have a different standard for heroism than the followers of Jesus have had throughout the past two millennia. Look at the heroes of the Christian faith. 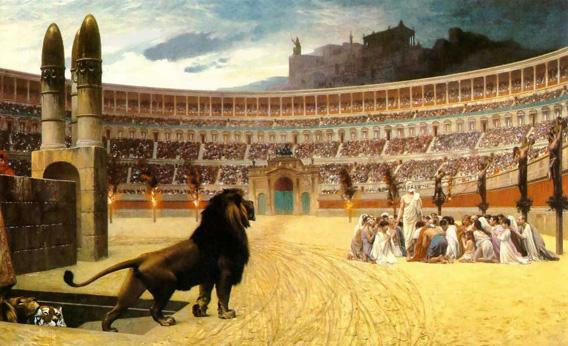 By and large they are martyrs—men and women who gave up their lives rather than compromise their allegiance to Christ. And a great number of them are particularly characterized by their refusal to fight and kill. Because of their view of Jesus’ cross and his words in the Sermon on the Mount, they knew that they were called to take the violence that was leveled at Christ rather than inflict violence in his name. Furthermore, many of them were martyred because of their refusal to put love of country before love of God. Their persecutors were torturing them to save the integrity of a nation or a religion. But the saints would stand only for the integrity of the gospel. Today we would call them deluded. Our American heroes are victors and those who made a nation strong (that is, strong by the standards of nationalism, but not by the standards of the gospel). Because we exult in the “greatest nation on earth” and pledge allegiance to it, we don’t really esteem those martyrs. For if they were with us today they would be considered to be fanatics who were willing to throw their lives away for a utopian vision. Dying for one’s faith is cultish and weird. Dying and killing for one’s nation is noble. Refusing to kill or die for your nation is reprehensible. Of course, this is not new with America. The kingdoms of this world have always placed love of country above love for God. They propagandize it by convincing people that they are one and the same, but the saints knew better. What is disturbing to me is how American Christians have given in to the state propaganda of God and country. We idolize the founding fathers and revere the Constitution as if it were a divine document. So we look for heroes with different values than the martyrs of the Christian faith. A slave-owning, patriot who took up arms over excessive taxation is our idea of greatness. St. Francis is just some eccentric pacifist who didn’t do anything of real significance. American Christians are more apt to quote the NRA than Tertullian. Take a stroll through history. Yes, there are Christian warriors there. (But for many, such as Constantine, you have to stretch “Christian” into some strange proportions to make it fit.) You’ll find those warriors, but you’ll also find a lot of martyrs. They’re the ones who came to be known as saints. A few hundred years from now there will be others strolling through the pages of Christian history. Let’s make sure we’re on the right side of that history.